Why are the “Dropa Stones” the most searched for subject on Bad Archaeology? Looking through the search terms by which people have been brought to the main Bad Archaeology website, I’ve discovered that far and away the most common search term is “Dropa Stones”. What are they and why are people in search of information about them being directed to my website? Even more importantly, why is there apparently so little other information out there about them that Bad Archaeology is currently the second link provided by Google (not that I’m complaining about its popularity)? The story of the Dropa Stones has been around since 1960, when Valentin Isaakovich Rich and Mikhail Borisovy Chernenko published the article “Hypotheses, assumptions and guesses: does the trail lead into space?” in the magazine Новое Русское Слово (Current Digest of the Russian Press, a Russian language newspaper published in the USA since 1910) Volume 12 No 9 (30 March 1960), p 24-6. This was a complete reprint of an article that had originally appeared in Литературная газета (Literaturnaya Gazeta) 9 February 1960, p 2, discussing the speculations of Matest M Agrest (1915-2005) that aliens might have visited earth in the remote past and left traces of their arrival. According to the article, which is summarised on the main website, a Chinese archaeologist named Chi Pu Tei made an unusual discovery in January 1938 in caves in a remote part of the country, in the Bayan Kara Ula mountain range. The caves contained a series of graves, while their walls were decorated with drawings of people with elongated heads together with images of the sun, moon and stars. The graves were found to contain the remains of beings little more than a metre tall, with abnormally large skulls. The archaeologists also found a stone disk a little over 300 mm in diameter, with a hole in the centre. A groove on the surface of the disk spiralled outwards from the centre hole to the rim and back, forming a double spiral. Another 716 disks were found in the caves by subsequent investigations. 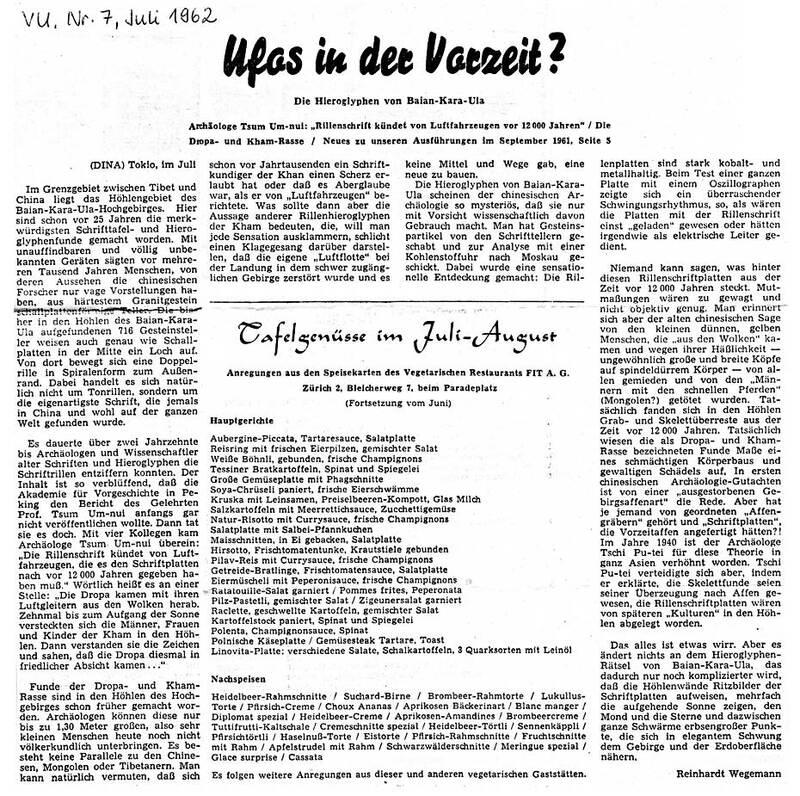 Two years later, the story turned up in the July 1962 edition Das Vegetarische Universum, a German vegetarian magazine, which published a story attributed to a Reinhardt Wegemann called Ufos in der Vorzeit? Die Hieroglyphen von Baian-Kara-Ula (‘Ufos in ancient times? The hieroglyphs of Bayan Kara Ula’). Intriguingly, the story is attributed to a news agency DINA, Tokyo; this is neither General Pinochet’s secret police nor the Mexican lorry manufacturer, so I am unsure what it is (it looks as if it could be the Deutsche Internationale Nachrichtenagentur”, although I can find no trace of such an agency). The same story, from the same (apparently non-existent) news agency, again credited to Reinhardt Wegemann, was published in UFO-Nachrichten, a German UFO magazine, in July 1964. The Belgian UFO organization BUFOI published a French translation in the March-April 1965 edition of its newsletter (number 4), to be followed by a Russian translation in 1967, bringing the story full circle. The Russian translation of the story was condensed by Vyacheslav K Zaitsev in the English language magazine Sputnik: the Russian Digest dating from 1967, where it was called ‘Visitors from outer space: science versus fiction’. Sputnik is a sensationalistic magazine similar to Britain’s Daily Sport and the USA’s National Inquirer (please note that you may not be able to see its pages outside the USA) and the only other sources simply repeat the original 1960 story, with no additional information. 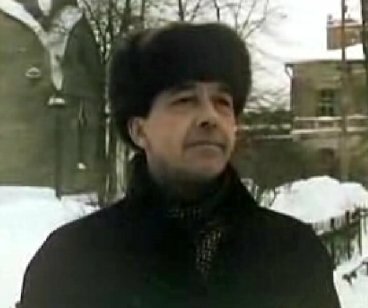 Some have suggested that Valentin I Rich and Mikhail B Chernenko never existed and were pseudonyms. However, they published a book in 1964, Сквозь магический кристалл: повесть о мысли (‘Through the Magic Crystal: a story of ideas’), on artificial diamonds, while Valentin Rich published Охота за элементами (‘The hunt for the elements’) in 1982 and В поисках элементов (‘In search of the elements’) in 1985 and so they appear to have been genuine popular science writers. However, no trace of either Reinhardt Wegemann or the DINA news agency can be found outside the story first published in Das Vegetarische Universum. In a curious twist of fate, the Wikipedia article on the Dropa Stones currently redirects to an account of the Sungods in Exile hoax. In 2007, it carried a fairly extensive page about the stones under the heading of Dropa, with only a brief mention of Sungods in Exile; in 2009, there was a much shorter but completely uncritical page. It is always interesting to watch the evolution of Wikipedia pages. What is unusual in this case is the transformation of a relatively complete and reasonably balanced page into something very bland that does not justice whatsoever to the complexities of the case. Previous Royston Cave, the Knights Templar and The da Vinci Code: an underground conspiracy? Dunno, it’s fairly common for it to come up. I see it often on forums. Yes, I agree that it’s a commonly repeated myth, but it’s also one that has been debunked so many times. It’s depressing that so much traffic arrives at my site thanks to this bit of fiction. 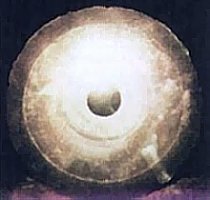 I think, although I am not 100% sure as it’s been several months ago, that I heard about Dropa Stones on a show on The History Channel. It was one of the numerous alien shows with the guy with the big hair. Sorry I have no memory for names most of the time. I noted this name & Piri Reis map to look up later to find out more about it. As for why I ended up on your site, and why I will assume many others do as well, the name of your website indicated to me it would be similar to a Snopes of the unexplained. I’m not really sure how else to explain that but I think you’ll understand my explanation. I will still read some of the other sites info on Dropa Stones but I suspect they will all say the same as whatever show I was watching (I’m such a geek for those shows). Thanks for your site & blessings! The History Channel at one time, was a great education tool. Unfortunately it has become the lair of pseudoscience. It seems they are more interested in making money, than actually showing real history. Most of their shows, these days devote themselves to obvious hoaxes such as Nazi Flying Saucers, and the discovery of Atlantis! it’s interesting to know that if the caves where dropa stones were found (along with graves and paintings on the walls) are an important part of the story then why no one has ever looked for them..if a lot of researchers are interested in the origin of this story then why have they not tried to look for such caves and the supposed skeletons in them to verify their authenticity..the dropa stones have been a sensation but still there is not much said about these caves..
Today I get the article published in 1960 in the Literaturnaja Gazeta. There is no word about the Stone disks.